Fay Ajzenberg-Selove (February 13, 1926 – August 8, 2012) was an American nuclear physicist. She was known for her experimental work in nuclear spectroscopy of light elements, and for her annual reviews of the energy levels of light atomic nuclei. 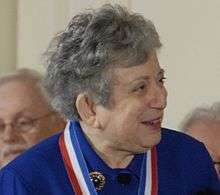 She was a recipient of the 2007 National Medal of Science. She was born Fay Ajzenberg on 13 February 1926 in Berlin, Germany to a Jewish family from Russia. Her father, Mojzesz Ajzenberg, was a mining engineer who studied at the St. Petersburg School of Mines and her mother, Olga Naiditch Ajzenberg, was a pianist and mezzo-soprano who studied at the St. Petersburg Academy of Music. In 1919, they fled the Russian Revolution and settled in Germany, where her father became a wealthy investment banker. They were bankrupted by the Great Depression, so the family moved to France in 1930. Her father worked as a chemical engineer in a sugar beet factory owned by her uncle Isaac Naiditch in Lieusaint, France in the department of Seine-et-Marne. Ajzenberg attended the Lycée Victor Duruy in Paris and Le Collège Sévigné. In 1940, the family fled Paris prior to the Nazi invasion of France. They took a tortuous route through Spain, Portugal, the Dominican Republic, and Cuba before they settled in New York City in April 1941. Ajzenberg graduated from Julia Richman High School in 1943. Her father had encouraged her interest in engineering. She attended the University of Michigan, where she was friends with the later notorious Haitian dictator "Papa Doc". She graduated in 1946 with a BS in engineering, the only woman in a class of 100. After briefly doing graduate work at Columbia University and teaching at the University of Illinois at Navy Pier, she began doctoral studies at the University of Wisconsin–Madison. At Wisconsin she worked with the nuclear physicist Hugh Richards who was studying nuclear reaction energies and classifying the energy levels of light atoms. She found a method of creating 6Li targets by converting the sulphate to a chloride and electroplating it to the target. She also demonstrated that the excited states of the 10B nucleus were not evenly spaced as previously thought. She received her MS in 1949 and her PhD in physics in 1952 with a dissertation titled "Energy levels of some light nuclei and their classification." She did postdoctoral work with Thomas Lauritsen at the California Institute of Technology. Together they would publish Energy Levels of Light Nuclei, a compilation of the field's best yearly research regarding nuclear structure and decay of nuclei with an atomic mass number A from 5 to 20. Since 1973 Ajzenberg published them herself. Eventually Ajzenberg would publish 26 of these papers, primarily in the journal Nuclear Physics, until 1990. They have been called "the nuclear scientists' bible." Following graduation, Ajzenberg was a lecturer at Smith College and a visiting fellow at the Massachusetts Institute of Technology. She was hired as an assistant professor of physics at Boston University, but the dean lowered her salary 15 percent when he learned Ajzenberg was a woman. Ajzenberg refused the position until the initial salary was restored. While at Boston University, she met Harvard University physicist Walter Selove and they married in December 1955. In 1962, using the bubble chamber at the Brookhaven National Laboratory, he discovered a meson he named the fayon (f2) after her. Ajzenberg-Selove and her husband were honored with a symposium about their work at the University of Pennsylvania in 2005. Selove died in 2010. In the 1960s, she worked at Haverford College, where she was the first full-time female faculty member. In 1970, Ajzenberg-Selove began teaching at the University of Pennsylvania, where Selove had taught since 1957. In 1972, she applied for one of three tenured positions there. She was not hired; the reasons cited were age and "inadequate research publications". Ajzenberg-Selove was only 46, had a citation count higher than everyone in the physics department except for Nobel laureate J. Robert Schrieffer, and was Nuclear Physics Section chair of the American Physical Society. She filed complaints with the Equal Employment Opportunity Commission and the Pennsylvania Human Relations Commission and in 1973 the University of Pennsylvania was ordered to give her a tenured professorship. She became only the second female professor in the university's School of Arts and Sciences. In 1994, she published a memoir, A Matter of Choices: Memoirs of a Female Physicist. ↑ "Penn Physicist Fay Ajzenberg-Selove Among Eight Scientists to Receive the 2007 National Medal of Science | Penn News". Upenn.edu. 2008-08-26. Retrieved 2012-09-08. ↑ "Physics professor Ajzenberg-Selove; honored by U.S. - Philly.com". Articles.philly.com. Retrieved 2012-09-08. 1 2 3 4 5 6 7 8 9 10 11 McLane, Victoria (1993). "Fay Ajzenberg-Selove". In Grinstein, Louise S.; Rose, Rose K.; Rafailovich, Miriam H. Women in Chemistry and Physics: A Biobibliographic Sourcebook. Greenwood Press. pp. 1–8. ISBN 978-0-313-27382-7. 1 2 Lubkin, Gloria (2013). "Fay Ajzenberg-Selove". Physics Today. 66 (6): 62. Bibcode:2013PhT....66f..62L. doi:10.1063/PT.3.2018. ↑ Anleitner, Joselyn; Kaitlyn Beyer; Candyce Boyd (2011). "Fay Ajzenberg-Selove (Interview audio and transcript)". A Series of Firsts: Women in Michigan Science and Engineering, 1940-1985. University of Michigan Women in Science & Engineering. Retrieved 30 July 2013. ↑ "On the Death of Professor Emeritus Hugh T. Richards" (PDF). University of Wisconsin. 7 May 2007. Retrieved 9 August 2013. ↑ Ajzenberg-Selove, Fay. A Matter of Choices: Memoirs of a Female Physicist. New Brunswick, NJ: Rutgers UP, 1994. Print. "I explained carefully to Louis that I was a Jew and an atheist..."
1 2 Hagopian, Vasken; Hagopian, Sharon; Kononenko, Walter (April 2011). "Walter Selove". Physics Today. 64 (4): 72. Bibcode:2011PhT....64d..72H. doi:10.1063/1.3580502. 1 2 Wayne, Tiffany K. (2011-01-01). American Women of Science Since 1900. ABC-CLIO. ISBN 9781598841589.